Heart-tugging tales of rescued puppies from the world’s most famous dogs home! Follow these adorable cuties as they meet their adoptive owners, taking their first wobbly steps into a brand new life! Based on the true stories of real-life animals at the Battersea Dogs Home, these stories let you walk in the paw-prints of heaps of fluffy characters – some cheeky, some clumsy, some adorably impish… and some as good as gold! Each story from this bestselling series raises money for the Battersea Dogs and Cats Home, and contains a photo and fact-file of a real dog from the home, plus puzzles and tips on looking after a pet. A pack of really great books, about the cutest dogs ever! 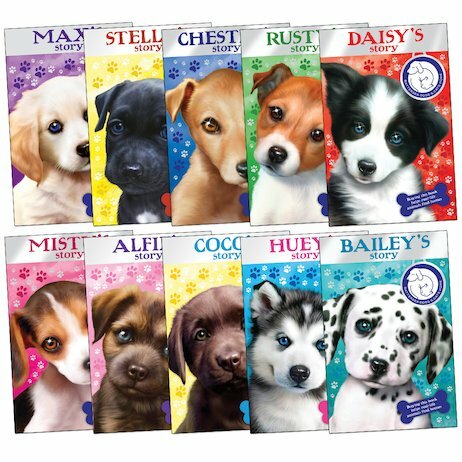 If you buy Battersea Dogs Home pack you get a wide range of books.My best book had to be Max`s Story because i had just moved school and Olivea,the 2nd main chareter,she needs to move school.She soon get`s Max,the playful puppy,but he`s alittle too playful!